NETWORK UPDATE: There were no changes from the New Year’s night preliminaries. CABLE HIGHLIGHTS: ESPN’s COLLEGE FOOTBALL bowl games and related programming continued to dominate cable, with 6 of the Top 10 slots, the top game being the ROSE BOWL (3.58), with the FIESTA BOWL (2.78) and SUGAR BOWL (2.55) behind. ESPN2 contributed too, with a game at 0.74. On the non-football front, Discovery’s GOLD RUSH returned at 1.34, with lead-in GOLD RUSH: THE DIRT down a tick to 0.58. 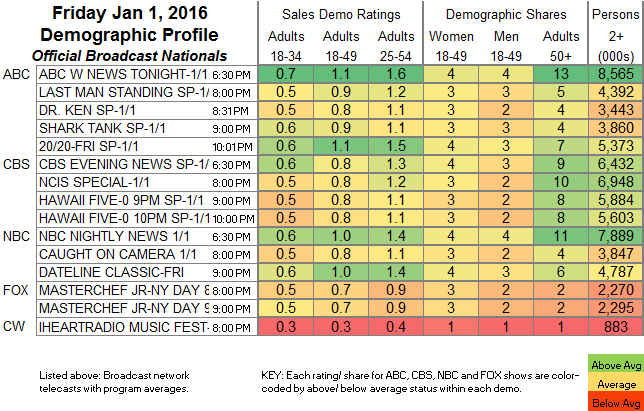 Lifetime’s BRING IT returned at 0.57, with a lead-in special at 0.41 and new lead-out THE RAP GAME at 0.51. HGTV was led by FIXER UPPER at 0.55, with TINY HOUSE HUNTERS at 0.45/0.42. 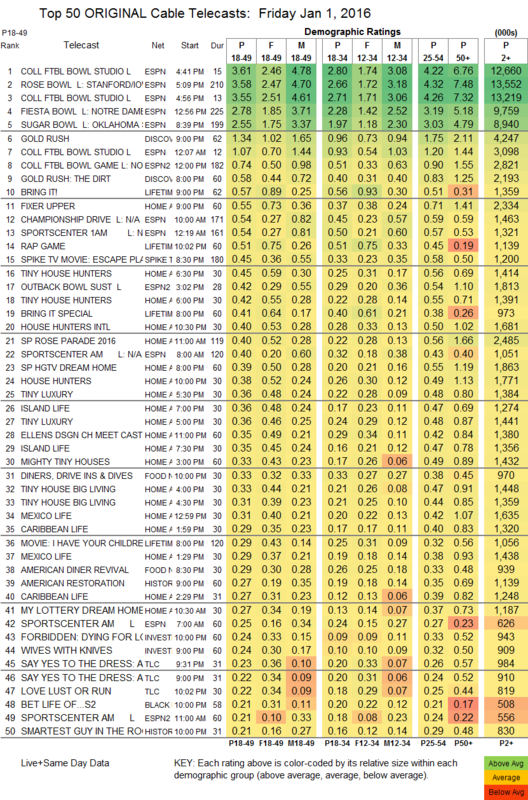 On Food Network, DINERS DRIVE-INS AND DIVES was at 0.33, and AMERICAN DINER REVIVAL at 0.29. TLC aired 2 episodes of SAY YES TO THE DRESS at 0.23/0.22, followed by LOVE AT FIRST SWIPE at 0.20. Both episodes of History’s SMARTEST GUY IN THE ROOM were at 0.21. A&E’s UNFORGETTABLE was at 0.14.